One of the most competitive automobile markets in the world is Japan. With a host of manufacturers, a prosperous economy and a thriving car culture, the Japanese domestic market is filled with interesting vehicles of which most of the rest of the world knows little. Michael Sorokowski, 38, and IT specialist, used to fit into that category. Three years ago, his friend looked into acquiring a front clip for a car he was restoring. Sorokowski and his friend discovered that it wouldn’t cost much more to import a whole car from Japan, and a business was born. The cult status of many Japanese domestic market cars, especially the Nissan Skyline performance cars, meant the partners had an almost instant market. Soon, Sorokowski got the bug for a unusual machine of his own. 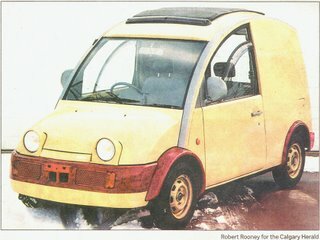 What he got was a 1989 Nissan S-Cargo. One of a group of very different, not to say eccentric, Nissan-based vehicles built by the Pike Factory in Japan, the S-Cargo bears a strong resemblance to the Citroen 2CV – considered one of the oddest-looking cars ever built. Sorokowski explains the name has a double-meaning. “S meaning small, and cargo for cargo van is obvious,” he says. “The whole look of the car matches the French word ‘escargot’ “ and the car has a number of subtle snail motifs worked into its trim. Production figures on the S-Cargo are unclear, but estimates are that between 10,000 and 12,000 were built in the late ‘80s and early ‘90s. With only 47,500 kilometers on it, Sorokowski’s find is low-mileage even by Japanese standards. Powered by an early ‘80s Nissan Sentra 1.5-litre engine, the S-Cargo isn’t exactly a powerhouse, but Sorokowski didn’t buy it because of its performance. It is the undeniably individual style of the car which caught his attention. From canvas top to the bug-eyed halogen lights – “they stick up because it looks like a snail” – to the wood-look bumpers and fender flares, nothing on Calgary’s streets looks quite like the S-Cargo. “I was interested in the car itself,” he says. “It wasn’t until I actually purchased it and brought it in that I realized there might be some promotional aspect. 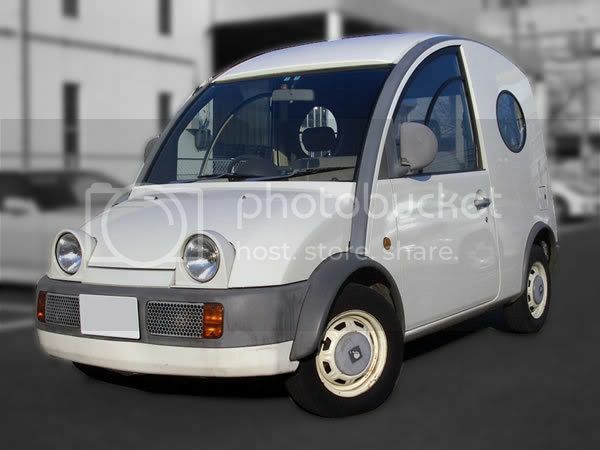 It’s more the interest, the unique look of it, plus the gas savings.” The S-Cargo got about 4.7 L/100 km (50 miles per gallon) – when it was running. Sorokowski enjoyed the public’s reaction. A careless driver running an intersection destroyed the S-Cargo this winter. No one was injured in the crash and Sorokowski plans to find and import a replacement for his happy car. I'd like to clarify a few statements made in this article as some of the info is not quite correct. Some of the info in the article was gathered from an interview with me, while some of it was gathered from research by the reporter... Probably from the Internet. And, of course, the Internet is one giant bathroom wall, so you got to figure out which info is right, and what's not. There were 12,000 units produced between 1989 and 1994, most of which were produced in the first year of production. This S-Cargo did not get 50mpg (Imperial gallons)... it got about 34mpg (8.3 L/100km) city driving. Which is still quite good considering the car was over 15 years old and had a carburetted engine.